Deep Learning is an continuously-growing, popular part of a broader family of machine learning methods, based on data representations. As a relatively new concept, the vast amount of resources can be a touch overwhelming for those either looking to get into the field, or those already engraved in it. A good way of staying updated with the latest trends is to interact with the community by engaging and interacting with the deep learning open source projects that are currently available. Fig. 1: Top 16 open source deep learning libraries by Github stars and contributors, using log scale for both axes. The color of the circle shows the age in days (greener - younger, bluer - older), computed from Start date given on github under Insights / Contributors. By all measures, TensorFlow is the undisputed leader. Keras, Caffe, Microsoft Cognitive Toolkit, and PyTorch completing the top five. Stars: 96655, Contributors: 1432, Commits: 31714, Start: 1-Nov-15. Github URL: TensorFlow. Stars: 28385, Contributors: 653, Commits: 4468, Start: 22-Mar-15. Github URL: Keras. Stars: 23750, Contributors: 267, Commits: 4128, Start: 8-Sep-15. Github URL: Caffe. Microsoft Cognitive Toolkit (Previously CNTK) is a unified deep learning toolkit that describes neural networks as a series of computational steps via a directed graph. Stars: 14243, Contributors: 174, Commits: 15613, Start: 27-Jul-14. Github URL: Microsoft Cognitive Toolkit. Stars: 14101, Contributors: 601, Commits: 10733, Start: 22-Jan-12. Github URL: PyTorch. Apache MXnet is a deep learning framework designed for both efficiency and flexibility. It allows you to mix symbolic and imperative programming to maximize efficiency and productivity. Stars: 13699, Contributors: 516, Commits: 6953, Start: 26-Apr-15. Github URL: Apache MXnet. DeepLearning4J is part of the Skymind Intelligence Layer, along with ND4J, DataVec, Arbiter and RL4J. It is an Apache 2.0-licensed, open-source, distributed neural net library written in Java and Scala. Stars: 8725, Contributors: 141, Commits: 9647, Start: 24-Nov-13. Github URL: DeepLearning4J. Theano allows you to define, optimize, and evaluate mathematical expressions involving multi-dimensional arrays efficiently. However, in September 2017, Theano announced that any further major developments would cease after the 1.0 release. Don’t let this put you off though, it is still an extremely powerful library that you can carry out deep learning research with it at any time. Stars: 8141, Contributors: 329, Commits: 27974, Start: 6-Jan-08. Github URL: Theano. TFLearn is a modular and transparent deep learning library built on top of TensorFlow. It was designed to provide a higher-level API to TensorFlow in order to facilitate and speed-up experiments, while remaining fully transparent and compatible with it. Stars: 7933, Contributors: 111, Commits: 589, Start: 27-Mar-16. Github URL: TFLearn. Stars: 7834, Contributors: 133, Commits: 1335, Start: 22-Jan-12. Github URL: Torch. Stars: 7813, Contributors: 187, Commits: 3678, 21-Jun-15. Github URL: Caffe2. Stars: 6726, Contributors: 120, Commits: 13733, 28-Aug-16. Github URL: PaddlePaddle. DLib is a modern C++ toolkit containing machine learning algorithms and tools for creating complex software in C++ to solve real world problems. Stars: 4676, Contributors: 107, Commits: 7276, Start: 27-Apr-08. Github URL: DLib. Stars: 3685, Contributors: 160, Commits: 13700, Start: 12-Apr-15. Github URL: Chainer. Stars: 3466, Contributors: 77, Commits: 1112, Start: 3-May-15. Github URL: Neon. Stars: 3417, Contributors: 64, Commits: 1150, Start: 7-Sep-14. Github URL: Lasagne. H2O.ai, Open Source Fast Scalable Machine Learning Platform For Smarter Applications (Deep Learning, Gradient Boosting, Random Forest, Generalized Linear Modeling, Automatic Machine Learning, ...). Stars: 3017, Contributors: 102, Commits: 22771, Start: 2-Mar-14. Github URL: h2oai/h2o-3. PyLearn2 . Stars: 2573, Contributors: 119, Commits: 7119. Github URL: PyLearn2. BigDL. Stars: 2385, Contributors: 50, Commits: 2330. Github URL: BigDL. Shogun. Stars: 2068, Contributors: 145, Commits: 16521. Github URL: Shogun. Apache SINGA. Stars: 1362, Contributors: 31, Commits: 869. Github URL: Apache SINGA. Blocks. Stars: 1099, Contributors: 48, Commits: 3257. Github URL: Blocks. Mocha. Stars: 1031, Contributors: 41, Commits: 1064. Github URL: Mocha. 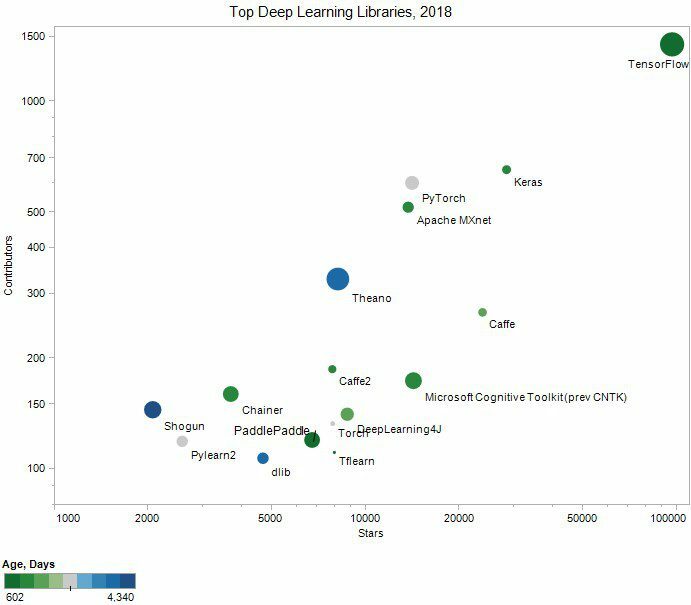 So that’s our extensive list of the top deep learning libraries and platforms. If you know of any we’ve missed out, please let us know in the comments! The contributors and commits were recorded on April 17, 2018.